26 MMS September 2017 mmsonline.com RAPID TRAVERSE Machining Technology in Brief the photo on this page.) For its five-axis version, one concession the Unilock system makes is in its clamping mech- anism, Mr. Zaya says. Pneumatic clamp- ing is t ypical, but receivers used for five-axis machining feature mechanical clamping instead. This avoids any danger of air lines becoming tangled within the five-axis motion. The system's quick-change capabil- ity remains valuable even in the five-axis context, he notes. 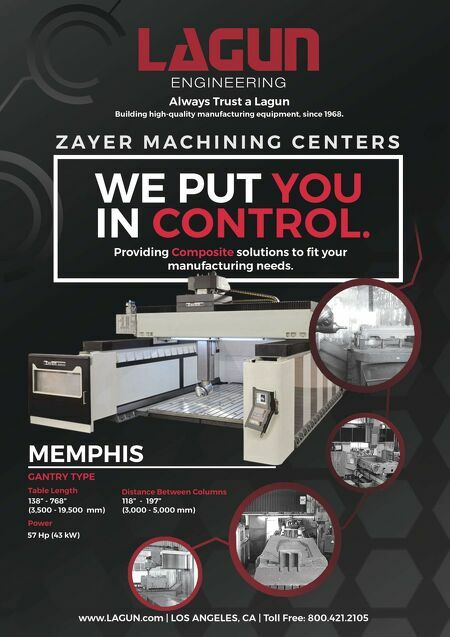 Because the five-axis machine is liable to be the most expen- sive machine in a given shop, it needs to be dedicated to the most valuable work. Using this workholding in conjunc- tion with receivers on multiple machin- ing centers can facilitate this priority by enabling roughing to be performed on a lower-cost three-a xis machine. The work is then removed from the three-axis machine's set of receivers and quickly transferred and clamped into the five-axis machine's receivers so that the more costly machine can be used solely for the high-value precision-finishing work. 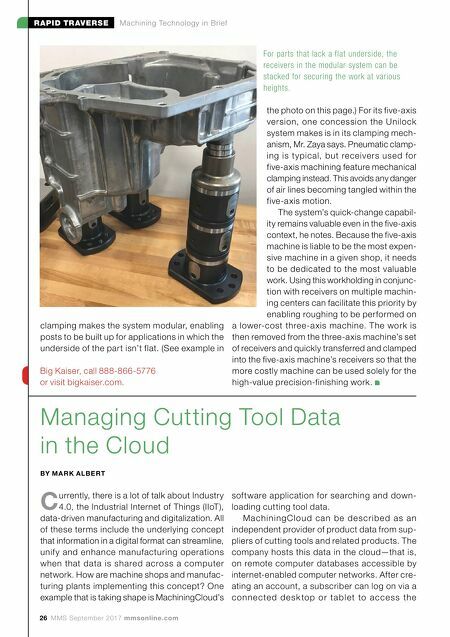 Managing Cutting Tool Data in the Cloud BY M A R K A LB E RT clamping makes the system modular, enabling posts to be built up for applications in which the underside of the part isn't flat. (See example in Big Kaiser, call 888-866-5776 or visit bigkaiser.com. C urrently, there is a lot of talk about Industry 4.0, the Industrial Internet of Things (IIoT), data-driven manufacturing and digitalization. All of these terms include the underlying concept that information in a digital format can streamline, unif y and enhance manufacturing operations when that data is shared across a computer network. How are machine shops and manufac- turing plants implementing this concept? One example that is taking shape is MachiningCloud's sof tware application for searching and down- loading cutting tool data. M a c h i n i n g C l o u d c a n b e d e s c r i b e d a s a n independent provider of product data from sup- pliers of cutting tools and related products. The company hosts this data in the cloud—that is, on remote computer databases accessible by internet-enabled computer networks. After cre- ating an account, a subscriber can log on via a c o n n e c te d d e s k to p o r t a b l e t to a c c e s s th e For parts that lack a flat underside, the receivers in the modular system can be stacked for securing the work at various heights.